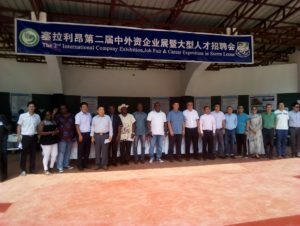 Economic and Commercial Counsellor of the Chinese Embassy in Freetown has described employment as the cornerstone of wellbeing and the wellspring of wealth. Zhang Xueqian stated that nowadays, investment has become the key engine of job creation, which is why the embassy keeps encouraging Chinese investment in the country. He was speaking on Saturday March 30, 2019, during the opening ceremony of the 2nd International Company Exhibition, Job fair and Career Exposition in Sierra Leone, organized by the Academic and Career Advisory and Counselling Services at Fourah Bay College, University and the Confucius Institute. The event was meant to create a platform for graduates to meet with local and international companies, especially from China and ask relevant questions with regards their operations and possible employment. Mr. Xueqian said with increasing Chinese companies investing and implementing China-aid projects in the country, employment has been hugely expanded, citing the Wellington to Masiaka Highway Project, which has directly created more than 800 jobs for the local workforce. “Vocational education plays an important role in every individual’s career, as well as this country’s social and economic growth. It is worth noting that the President Bio-led government has attached great importance to vocational education and human resources development,” he said. He pledged his country’s commitment to support capacity building of Sierra Leone and added that so far, managers, accountants and workers of the private sectors have been benefiting from the China-aid short term training programs and MOFCOM scholarships. Mr. Xueqian continued that the event, which is being hosted for the second time, has no doubt established itself as a premier event in providing a unique opportunity to form partnerships between potential employers and employees. Resident Representative of the United Nations Development Programme (UNDP), Dr. Samuel Doe, urged participants to make use of the opportunity by asking questions around the operations of the companies for possible employment. “About 60% to 70% of young people are not employed in Sierra Leone but they are not aware about the opportunities available. Make yourself employable,” he urged. He stated that for the past 50 years, the UNDP has been working with government and other stakeholders to promote the empowerment and employability of young people.